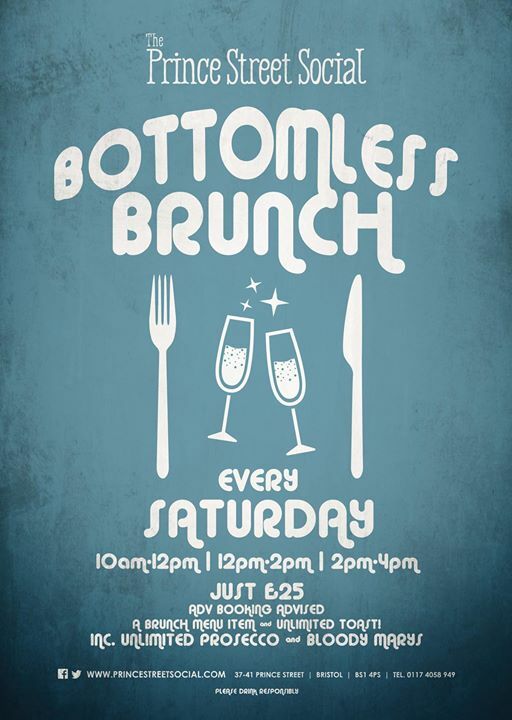 Join us for Bottomless Brunch on a Saturday at Prince Street Social. Booking is highly recommended as we tend to fill up quite quickly! You then have two hours to drink as much prosecco or beer as you wish, help yourself to the breakfast buffet with a toast station, sweeties, coffee and juices etc and order an item from our fantastic brunch menu. You get all this for £28 per person! To secure your booking we ask for a deposit of £5 per head that will then be removed from your bill on the day of your booking. Please do let us know if you have any special requests for your booking. We look forward to seeing you soon!